Installed this month, the Melbourne Pavilion in the beautiful surroundings of Somerset. Following the guidance of the GBC Group experts, our latest customer selected a fantastic Melbourne Pavilion to be placed in their truly beautiful garden. 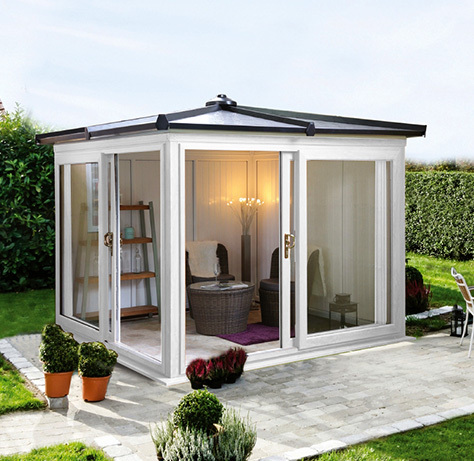 A number of options where considered but the contemporary colour and design of the Melbourne Pavilion ensures that the maintenance free Nordic Garden Building will give the latest Nordic customer many days of enjoyment, sitting relaxing and enjoying their new garden room without the anguish of painting, staining or any other maintenance worries. 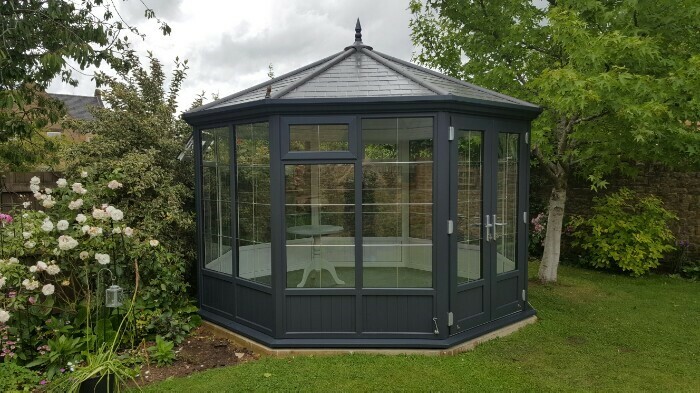 Finished in Grey with the fantastic grey tile effect roof, Mr & Mrs Martin have created an insulation place of tranquility to enjoy the Scandinavian feeling of Hygge. The award winning Nordic Melbourne pavilion has been a firm favourite for many years across the UK and throughout Europe. Whether you prefer to have a glazed roof so you can watch the night sky or a tile effect roof for the feeling of cosiness, you can really make the Melbourne design unique to you. 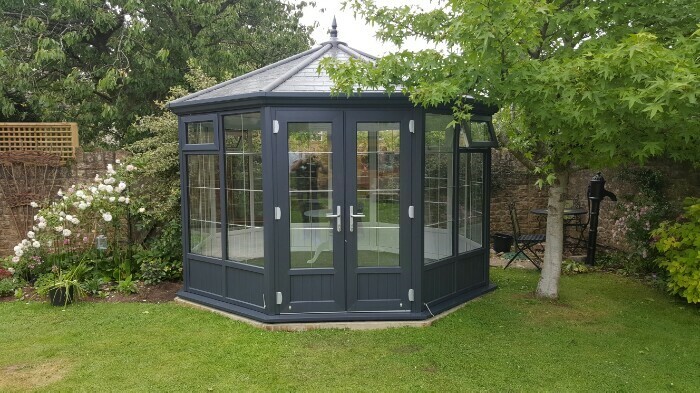 Unlike traditional wooden pavilions, you no longer need to worry about staining or painting as the Melbourne is maintenance free with high security locking features. 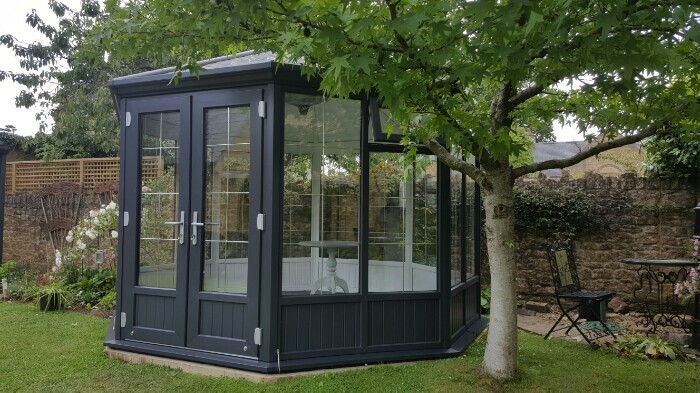 The inclusion of panels and Georgian bars add a real sense of opulence and gives you a garden room that can be used all year round. 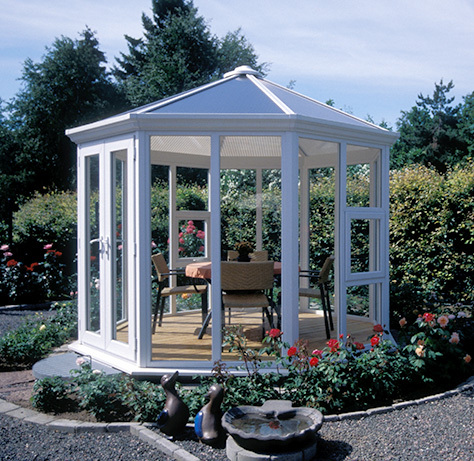 The full specification of the Melbourne is, h 2860mm w 2898mm d 2898mm – PVC-u frames, double glazed safety glass that contain Georgian glazing bars and panels at bottom of frames. 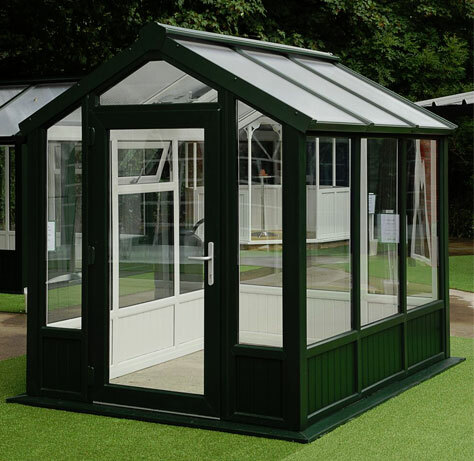 1 double door with multi-point locks, 4 lockable windows, adjustable door hinges, low aluminium threshold and external projecting sill, with polycarbonate roof. 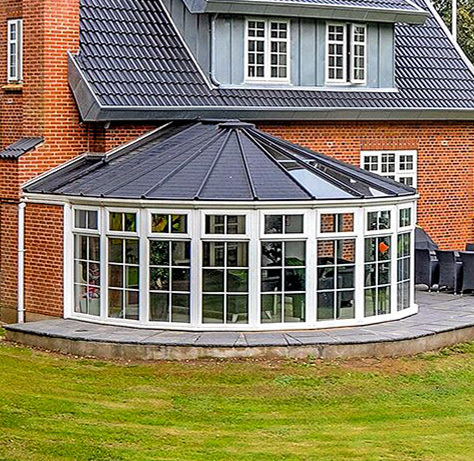 There are a number of alternative size options, frame colours as well as roof types, colours, therefore you really can make your Nordic Garden Building unique to you and your home. Focusing on long lasting and low maintenance buildings has been the driving force behind the growth of not only the company but also the range. 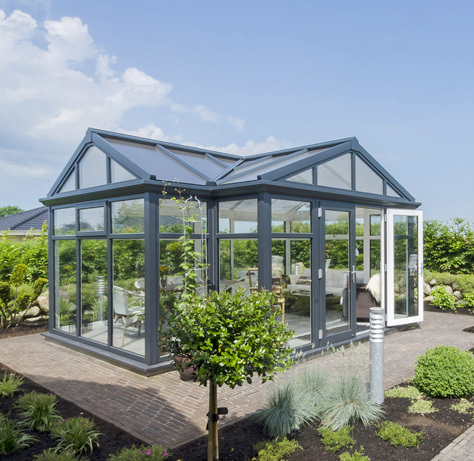 Now including over 30 different designs including garden rooms, summerhouses, pavilions and orangeries, we have developed a stunning but diverse range of styles to suit every garden, whether it’s in a classic English garden or a Scandinavian contemporary designed landscape, not only do we have the style but when you incorporate the different sizes, colours, or specification options, you have the choice of 000’s of ways to make your Nordic Garden Building unique to you.